Nestled in the heart of the Rocky Mountains resides The Fairways At Pole Creek. A premier golf community surrounding the magnificent 27 – hole Pole Creek golf course with beautiful rolling terrain along forested fairways with spectacular mountain views. The course itself has been highly acclaimed by the golfing community and has received numerous awards. Perfectly located, this community provides easy access to take advantage of the mountain lifestyle. Within minutes from your doorstep you can enjoy year round activities including world-class snow skiing and boarding, hundreds of miles of cross-county ski and snowshoe trails, fishing on the headwaters of the Fraser and Colorado Rivers, and the best hiking and mountain bike trails the country has to offer. Not to be forgotten, The Rocky Mountain Nation Park, Grand Lake, Lake Granby, Snow Mountain Ranch and Devil’s Thumb Ranch are also in close proximity and considered to be some of Grand County’s most treasured amenities. 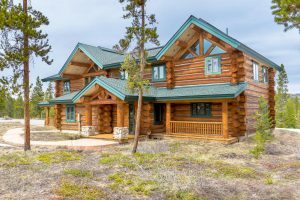 Located on 2 acres backing to open space, this beautifully furnished custom log home offers breathtaking views of the Continental Divide. Exceptional in style and quality, the open floor plan features an abundance of windows providing natural light and gorgeous views. The gourmet kitchen lends itself to entertaining on a grand or intimate with custom cabinetry, granite, generous breakfast bar and gracious dining area with a double-sided fireplace. Adjacent to the kitchen, the open and warm great room provides an inviting atmosphere with a handsome stone fireplace. An expansive deck, conveniently located off the kitchen and great room, extends the length of the home providing a private and relaxing retreat. The serene outdoor setting is perfect for entertaining or enjoying spectacular sunrises. The main floor also features a guest bedroom with full bath and convenient mudroom located off the garage. The upper level provides a well-designed master suite with a gas fireplace, large walk-in closet and a private balcony overlooking gorgeous views. A spacious family room, two additional bedrooms, ¾ bathroom, lofted play area, and laundry room completes this level.